Maggie Keswick Jencks and her husband Charles developed the idea of ”kitchenism” as a key element of the Maggie’s Centre experience. The kitchen is the social hub of every centre and the kitchen table is the focal point for social interraction; a place for people to sit, drink tea, eat biscuits and converse - fulfilling fundamental human needs for conversation, mutual support and friendship. This exhibition features a new collection of innovative furniture prototypes designed and crafted in Edinburgh which combine an architectonic-organic and component-based, contemporary, formal language. 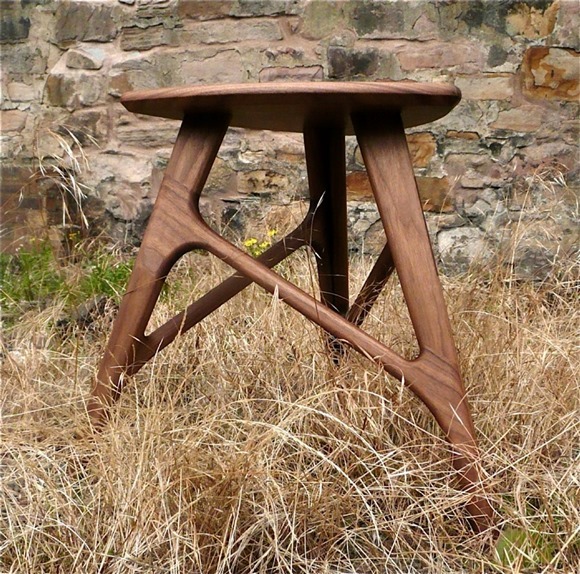 The centrepiece of the exhibition will be a new kitchen table for the Maggie’s Centre in Edinburgh, made from storm-fallen hardwoods donated by the Royal Botanic Garden Edinburgh - providing the opportunity for a “welcoming cup of tea around a communal table” and aiding the recovery process for thousands of Scots for many years to come. Based in Edinburgh, with a background in sustainable architecture, regeneration and therapeutic gardening, Simon Whatley creates innovative, architectonic designs that are distinctive, elegant and built to last. His holistic approach to problem-solving is based on careful analysis of end-user needs, a commitment to British craft manufacturing expertise and to environment-friendly processes. An approach which considers the system being designed as an interconnected whole and simultaneously part of something larger. Holistic concepts can be applied to all kinds of design problems, with primary consideration being given to how the design will reduce any potential negative impacts to the environment; protection of the biosphere, conservation of natural resources and reduction of waste. This project is part of a nationwide programme seeking to address the need to: increase civic engagement; face up to the reality of fast-diminishing resources; support the use of traditional skills and materials; and promote a better understanding of genuinely sustainable design.